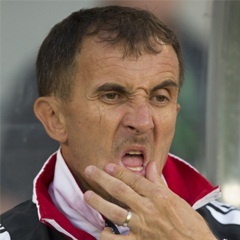 Cape Town - Orlando Pirates have unveiled Milutin 'Micho' Sredojevic as the club's new head coach. On Wednesday afternoon, the Buccaneers released a statement confirming the sudden departure of Kjell Jonevret after just over five months into the job. As soon as the Sowetan giants suffered a 4-1 defeat against SuperSport United in the Nedbank Cup final, speculation of the Swedish-born manager's exit began. Sredojevic's name was the first to be linked to the club as his contract with the Uganda national team came to an end. Micho, as he is fondly known in the soccer fraternity, now returns to the hot seat after 10 years. He previously mentored the Buccaneers for seven months from July 2006 to January 2007. "Orlando Pirates Football Club is pleased to announce the appointment of Milutin Sredejovic as new Head Coach," read a statement on the club's official website. "The 47-year old takes over with immediate effect. "Micho, as he is affectionately known, returns to the Bucs stable after joining as a 37-year old in 2008, where he led the squad to a CAF Champions League semi-final berth. "Since leaving the club, Micho has gone on to establish himself on the African continent for both club and country. "Micho recently led the Ugandan national team to their first African Cup of Nations participation in 38 years. "The newly appointed head coach is due to meet with the Chairman later today to discuss matters around the squad and his support staff." Meanwhile, club chairperson Irvin Khoza, has revealed that Oupa Manyisa has joined Premiership rivals Mamelodi Sundowns.